The Otto brings filtered drinking water and normal mains water together in a single innovative kitchen mixer tap. Not only will you get the health benefits of pure stainless steel surfaces inside your tap, but you can also connect an under-sink water purifier to provide perfectly clean drinking water! One lever operates drinking water from a dedicated discrete nozzle, and the other operates your hot/cold mains water supply. The timeless gooseneck design looks superb in any kitchen or butler's pantry, plus the black PVD finish is wear-resistant and even more attractive. The Otto kitchen sink mixer with filter is best paired with this under-sink water purifier, which can absorb and extract residual chlorine, unwanted organics, silica, and pathogenic bacteria. Get it with the Otto kitchen mixer today! The SWEDIA Otto is an innovative stainless steel mixer that includes two outlets - one mixer controls standard mains hot and cold water, and the other controls filtered drinking water. The innovative dual outlet nozzle either outputs a fine stream of filtered water from the centre, or temperature controlled mains water through the aerator. This fantastic design means you do not need a separate faucet tap for your filtered drinking water saving you valuable bench space and preserving a minimalist design. The classic goose-neck styling provides practical simplicity to your kitchen. The refined pencil handles and cushioned feel of the internal ceramic cartridge mixers make it easy to perfectly adjust the water temperature and flow. PVD or physical vapor deposition coating technology makes a tapware item more robust and attractive. The process involves passing through a vacuum chamber where metals like titanium and zirconium evaporate and eventually stick on to the product until the desired coating is achieved. With PVD coating, a tapware product is expected to harden and increase its resistance to abrasions, scratches and corrosion, making it last for a longer time. Stainless steel is another known durable metal. Aside from being harder, it is also more sanitary than chromed brass taps as it does not contain lead, a very harmful chemical that could be mixed with tap water over time. The SWEDIA® Otto is a stainless steel three-way kitchen tap - filtered drinking water plus hot and cold mains water! Its simple design hides the innovative internals that provide you with world-class filtered drinking water. An adventurous mix of function and flair, the Otto not only looks elegant with its sleek gooseneck design but it functions efficiently and with style. 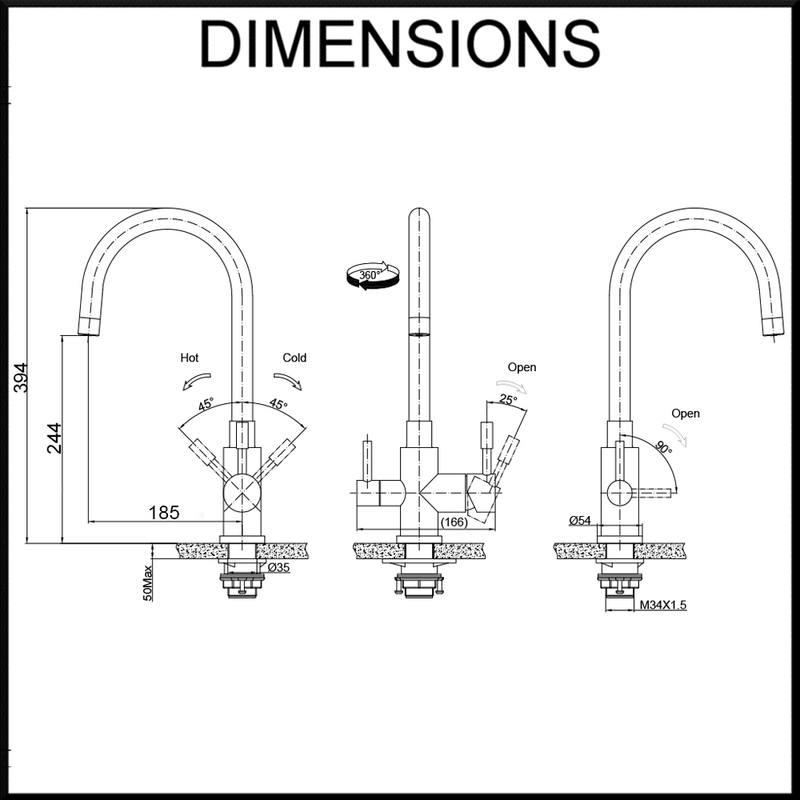 15 year warranty on faucet body. 4 year warranty on replacement ceramic cartridge. 12 month warranty on spare parts. Conditions apply - see Product Quality Guarantee.